Encouraged by government regulators, the conversion to waterborne paints is now moving into the collision repair and refinishing industry. However, the conversion to waterborne paints is proving to have implications for the compressed air systems for shops in this industry. 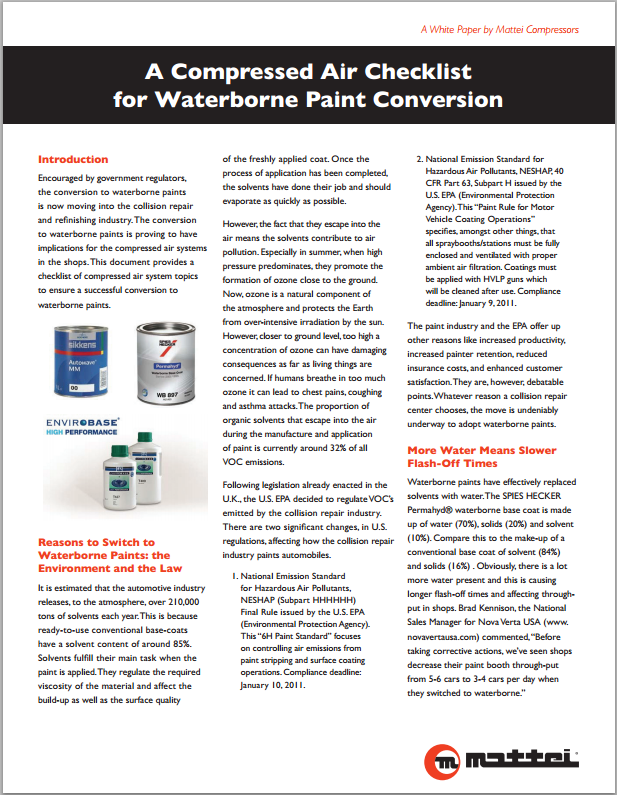 Mattei's newest resource, A Compressed Air Checklist for Waterborne Paint Conversion, ensures you have all of the information you need for a successful transition to waterborne paints. Venturi Paint-Drying Systems' ability to reduce flash times—and how to select an efficient system. Ensure your Venturi Paint-Drying Systems reduce the baking cycle by 30%. To obtain your free copy of A Compressed Air Checklist for Waterborne Paint Conversion, please complete the form to the right.